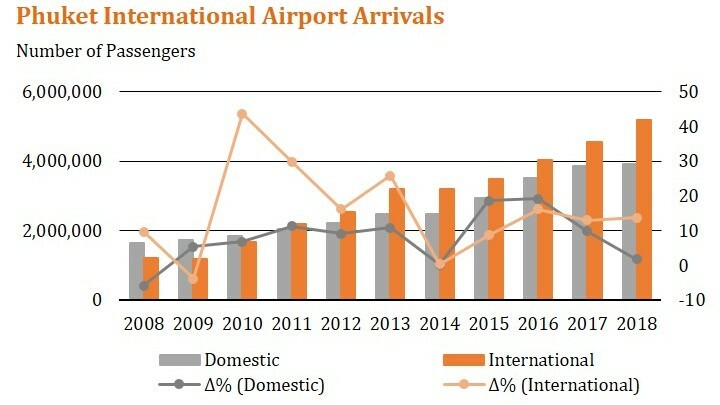 PHUKET: Despite registering a record high 9 million passenger arrivals at the island’s gateway international airport in 2018, performance data is indicating that a slowdown in its double-digit growth rates over the past few years is on the horizon for Thailand’s resort destination of Phuket, reports Bill Barnett, Managing Director of tourism and hospitality consultancy C9 Hotelworks. While airport arrivals grew 8% year-on-year, the gains posted were at their lowest level since 2015, he said, citing C9 Hotelworks’ newly released Phuket Hotel Market Update. As the first half of 2018 saw arrivals soar by 17% versus the same period in 2017, the second half of the year was marred by the Phoenix tour boat disaster, which decelerated momentum and by the end of the year annualised hotel demand had declined by 4%, Mr Barnett noted. “The period of August through October eradicated the early gains in the year. At that juncture, despite negative industry sentiment of a continued drop, a soft landing ensued in the final two months of the year driven mostly on rates, and by year-end the new normal kicked in,” Mr Barnett said in a release issued yesterday (Mar 8). Further reflecting on the prevailing trade winds at the end of 2018, Mr Palmqvist added, “This trend continued throughout peak season into 2019 where January was similar to that of 2015, with overall demand shifting by -6% compared to the same month last year. Indications in daily data for the important month of February echoes the sentiment hitting numbers close to 2017, leading to peak season ending with a noticeable step back. Diving into the numbers the reality is that demonstrated hotel performance is not dependent on macro tourism metrics alone but brand, location, and management play a key role in the battle of the haves and the have nots. An onslaught of other Asian destinations are targeting Chinese travelers and putting up incentives like visa-free entry. Brand Thailand is not alone it is quest for numbers. Phuket over the past few years has successfully managed to cash in when the going was good, and drive higher rates during periods of high demand. With a China slowdown, appreciation of the Thai baht and growing competition, rates are likely to be under attack in the foreseeable future. With surging land prices in Bangkok and other key Asian CBD areas, developers are adjusting their return outlook and continue to either transact properties in Phuket or undertake greenfield developments. A second factor is property development groups looking to mitigate risk in a challenged real estate sector and look at recurring cash flow investment models. No two hotels are created equal and changing travel preferences in terms of properties that offer unique design, best in class wellness offerings or other key demand generators are hitting numbers far ahead of their competitive set. 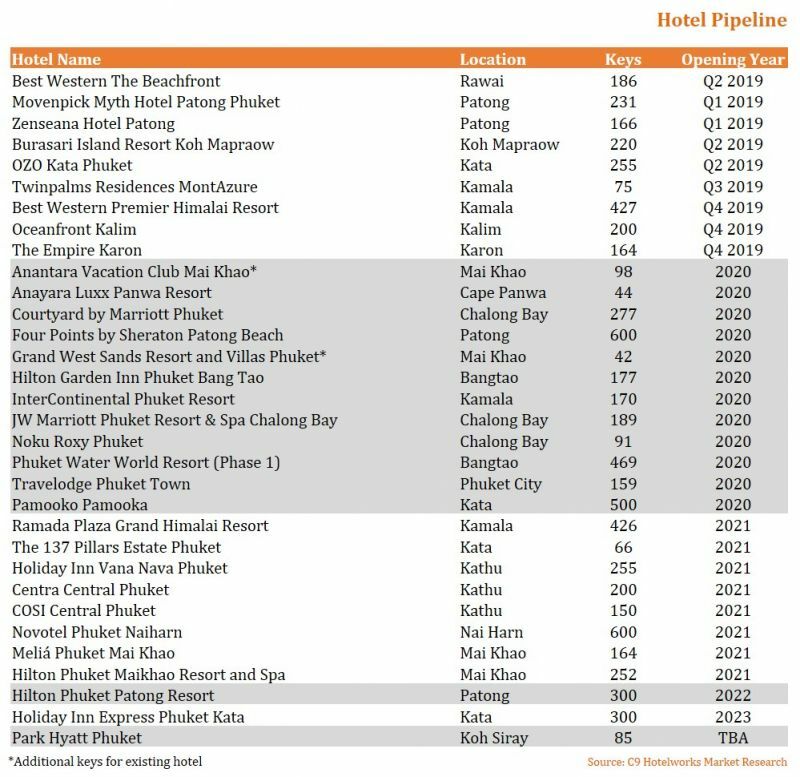 Closing out the outlook on Phuket, one of the key takeaways from C9 Hotelworks report is that India is seeing a rapid escalation of market prominence, the report noted. In 2018 Indian inbound travelers recorded a 56% year-on-year increase as direct flights to the island were opened from Mumbai, New Delhi and Bengaluru. With more airlift coming in 2019, eyes are now turned to the subcontinent as a supplement for the Mainland China mass travel machine, the report said. To download C9 Hotelworks Phuket Hotel Market Update, click here.